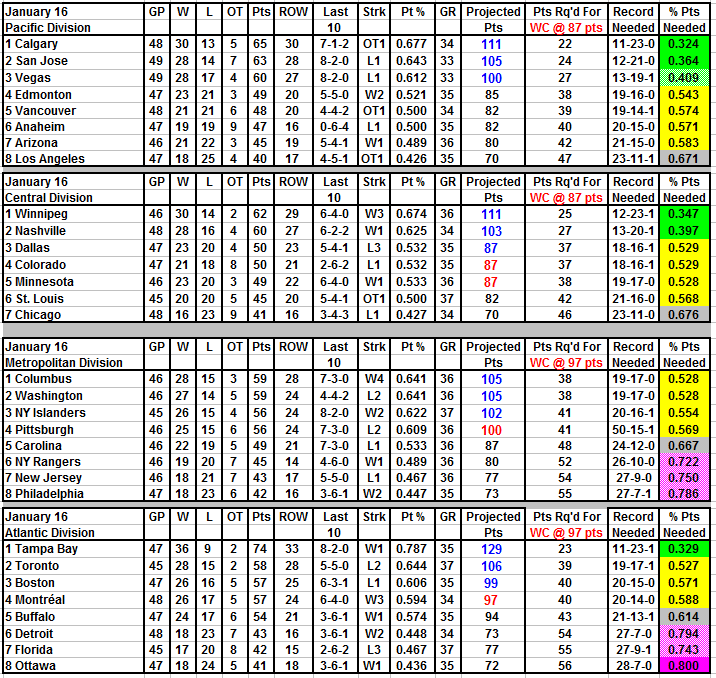 "Py" Chart at the proverbial American Thanksgiving cutoff for making the playoffs. The trends are still fuzzy due to the season only being 25% done. 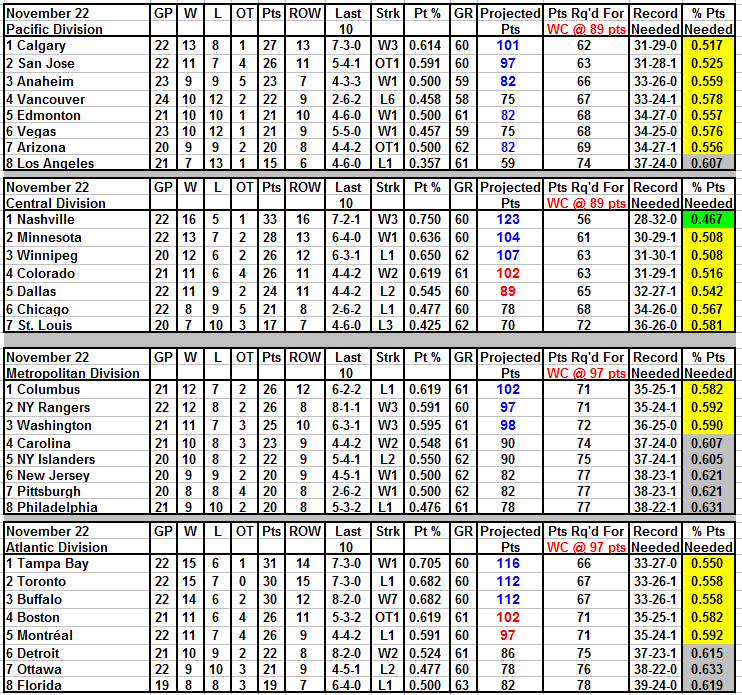 The Western Conference is trending to a 89 pt wildcard cutoff with 5 teams making it in the Central Division. 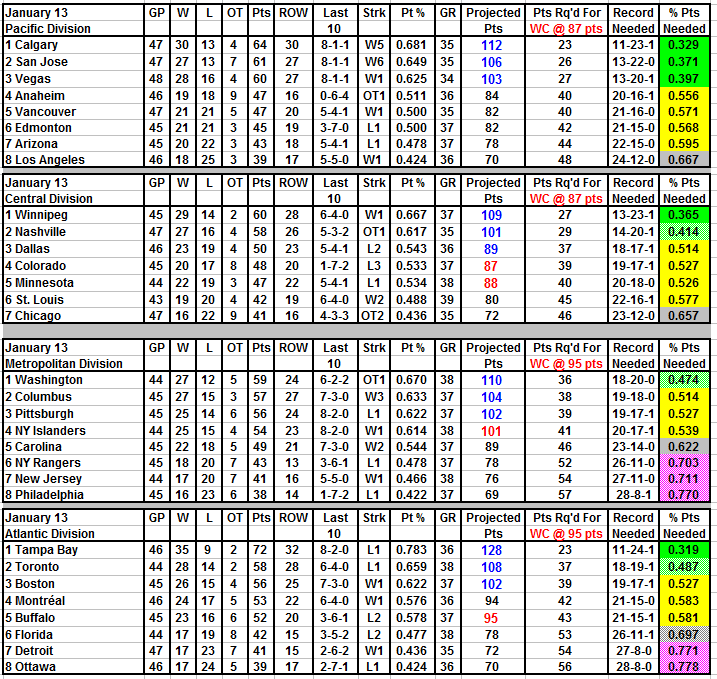 The Eastern Conference is trending to a 97 pt wildcard cutoff with 5 teams making it in the Atlantic Division. Next one at 40 games. i will take bribes to post one sooner however. 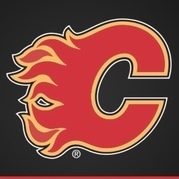 Honestly, at this point, I would really like Calgary's chances. Yeaaa, the Thanksgiving Pye Chart. And we look good on it. Amazing how the projected points for the last wild card spot is only 89 points. Let's go for the top. We are lucky to be in the worst division in the league. Hopefully we don't win the division and play the cross over team. But, let's not count our chickens before they hatch I guess. I actually think it would be better to play the crossover team. Don't want to get stuck in the first round with a Pacific team. If we ended up against a Central team, I could stand a Dallas or Colorado series. Just don't want to see the Ducks again. Or play the Sharks or LA. The Oilers would be epic, but would absolutely hate to lose a single game to them. The home games would be annoying with Oiler fans. The road games would be worse than playing against the Duck with that puke orange jersey. 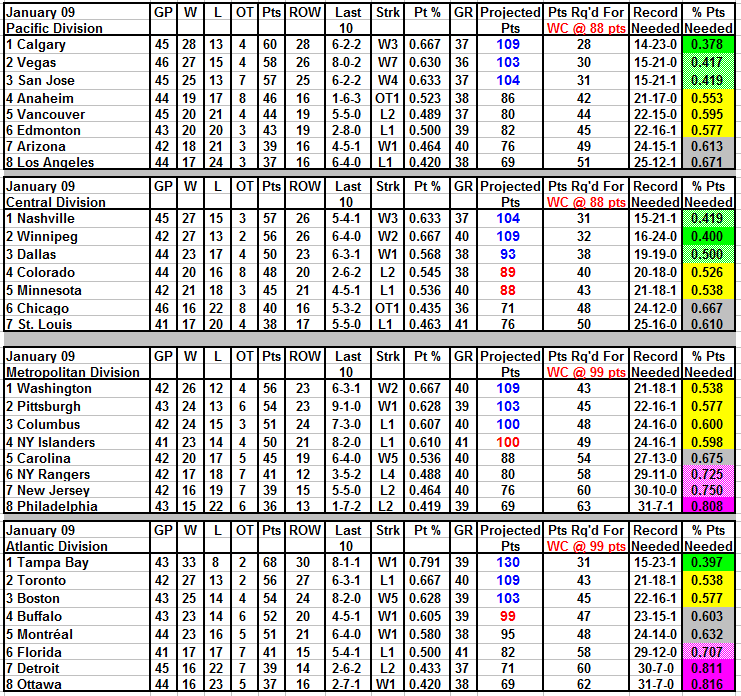 30 GP snapshot prior to today's games. 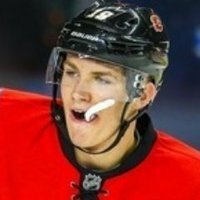 It's been a long time since the Flames needed a sub-50% record this late (early ) in the season to make the projected cut. 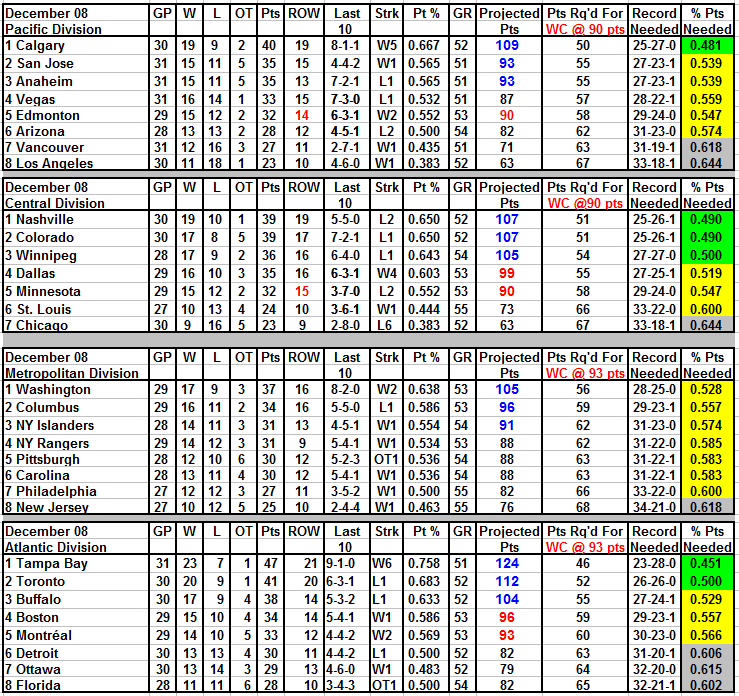 Only a miracle can save LAK & CHI now as a 33-18-1 record to reach even a lowball 90 pt WC cutoff is unrealistic. 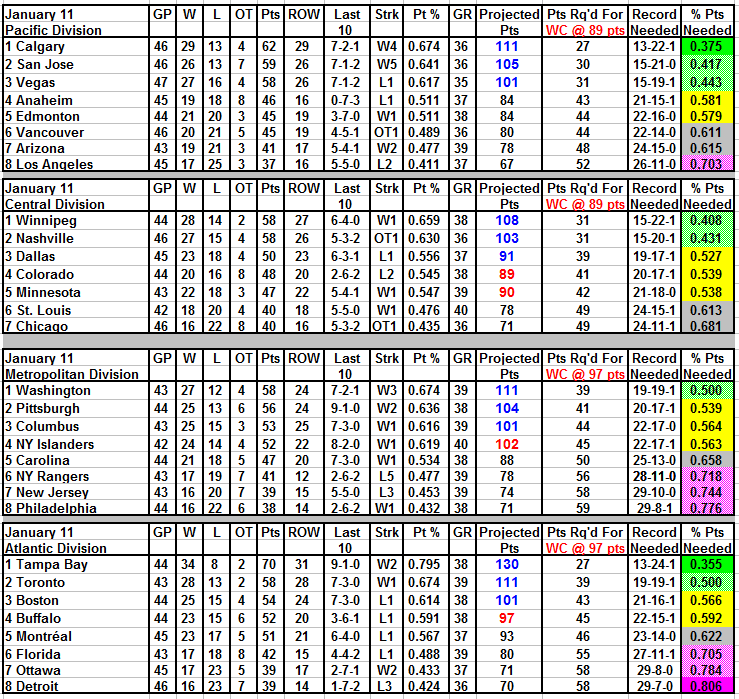 We get to see one where the Flames are projected to 109, and need less than 500 for a WC spot. Love to see this pace stays for some of the lean months. Thanks for the charts Pyro! The halfway mark for the Flames. We should easily manage a 18-23 record for the next half with our currrent roster. The projected WC cut-off is still quite different between East & West. I imagine both will probably gravitate towards the mid-90's when all is said & done. It’s crazy how different it is looking down at the standings as opposed to up. Wild card was pretty much the only realistic goal under GG...spent seasons just chasing the league. I am used to charting these in past years to keep track of my hopes & dreams that the Flames are capable of attaining a wildcard spot. Currently, the Eastern WC cutoff projection is at an inflated 99 pts; whereas the West's WC cutoff is at a suppressed 88 points. 14-23-0 will get us to that 88 pt, cutoff! Even if it increases to 96 points we still need a sub-.500 pt percentage of 18-19-0 to make the show. This makes great reading this season! 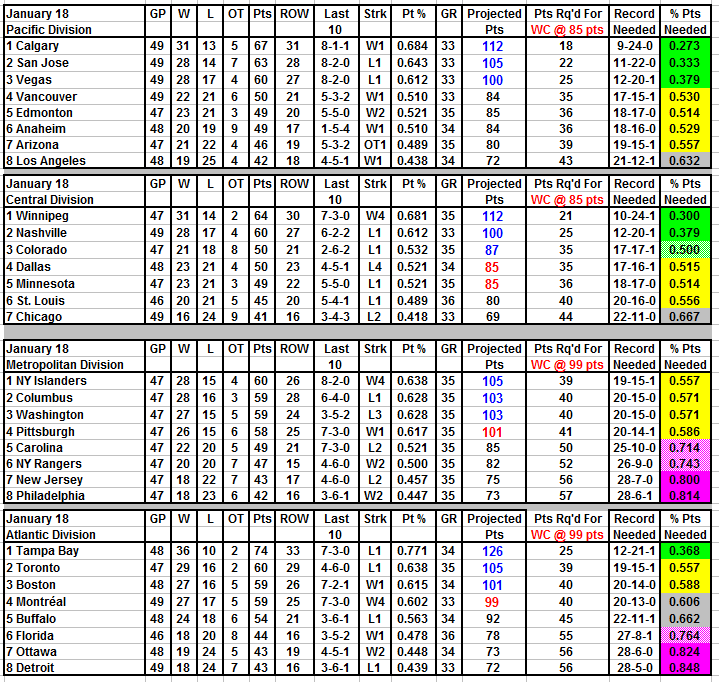 The West WC cutoff down to 87 pts. Now that is some low-hanging fruit! Totally possible a team with more losses than wins but lots of loser points could be a wildcard. Eastern WC cutoff finally coming back down to Earth at 95 pts. 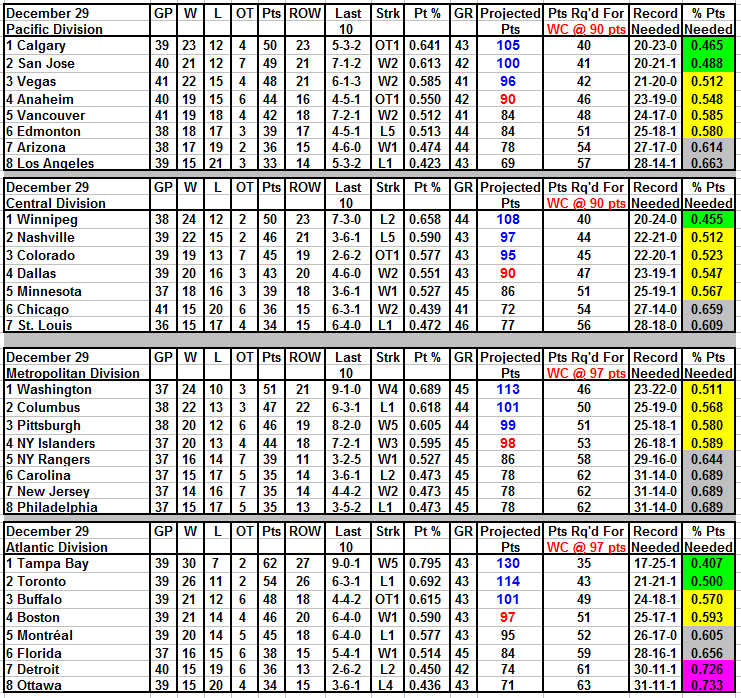 The current East (99 pts) vs West (85 pts) projected wildcard cutoff differential is massive. 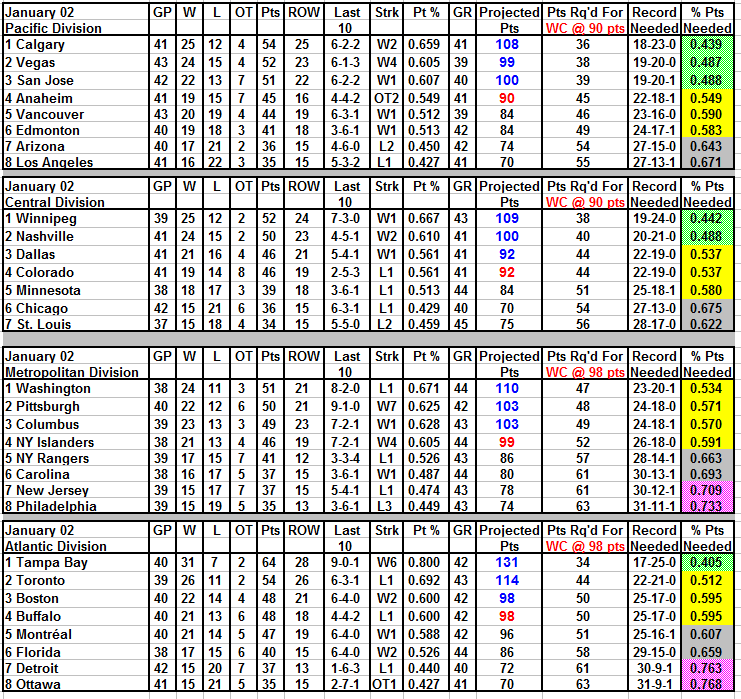 Anyone in the West can still make the postseason with only Chicago & Los Angeles showing a low probability. Just beat Edmonton tonight is all I ask. 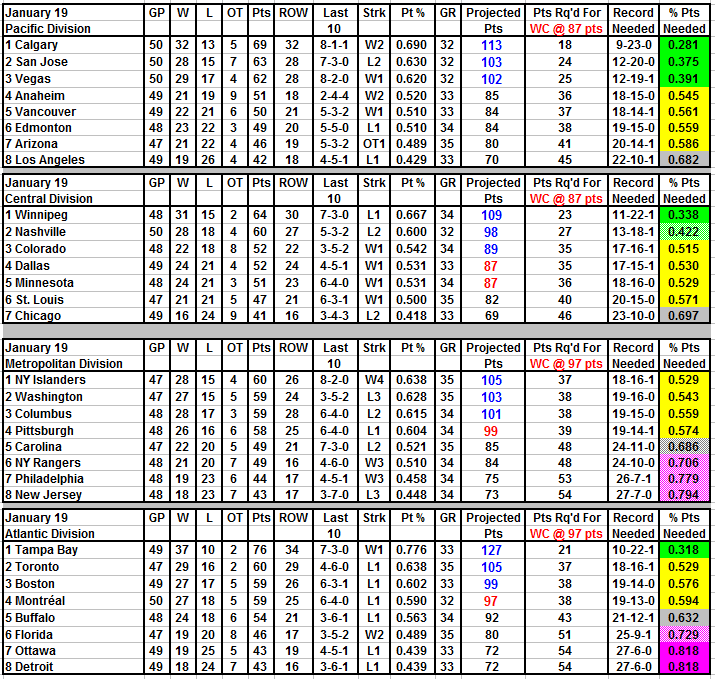 The team finally leads the West regardless of whether other teams with games in hand catching up! And wow! Suddenly, after not being able to shake the sharks nor the VGKs, the sharks are 6 points behind. Keep going and no counting chickens. I am superstitious. Just great to have a cushion after it being tight. Wow 87 points still for a wild card. Surely that's got to edge up to 94/95. This makes such lovely reading this year. Thanks Pyro for doing this each season.